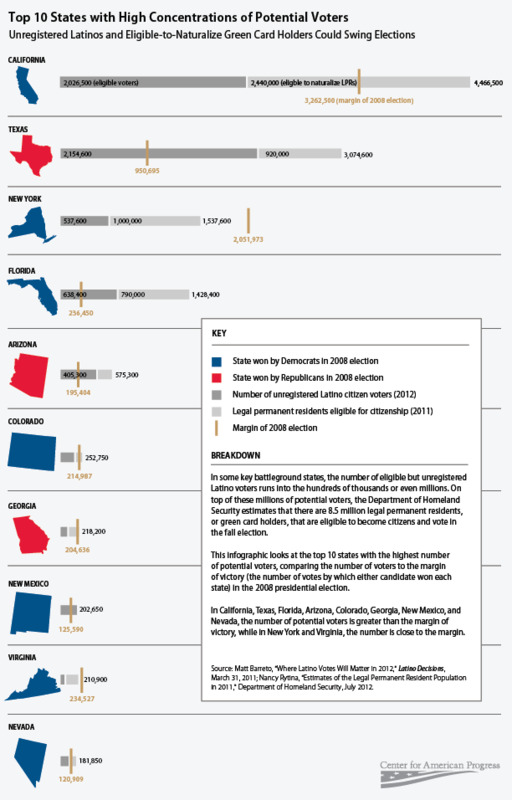 Updated Infographic: Where Are the Greatest Numbers of Potential Latino Voters? With only four months until the presidential election, Latino voters are center stage in the political debate. They already comprise at least 5 percent of the adult citizen population in almost half of all states and more than 10 percent in 11 states. Moreover, they are a key part of the electorate in a number of battleground states such as Nevada, Colorado, New Mexico, and Florida, and a segment of the population with the power to swing the election. The infographic below highlights the top 10 states with the highest concentration of potential voters—either eligible but unregistered Latino voters or green card holders that are eligible to become citizens and vote for the first time in November. * This infographic is the only place in which these two streams of potential voters have been compared side-by-side. In 8 of the 10 states highlighted, the number of potential voters already outnumbers the margin by which either then-Sen. Barack Obama (D-IL) or Sen. John McCain (R-AZ) won the state in 2008, in some cases far exceeding that margin. Like all voters, these potential voters care about a variety of issues, particularly the state of the economy and jobs. But immigration is a deeply personal issue for them. These voters care about how the parties talk about immigration and recent immigration events have only solidified this fact: A recent Latino Decisions poll in five swing states found that on average 30 percent of Latino voters know someone in removal proceedings and a full 55 percent know someone who is undocumented. These numbers rise to as high as 41 percent and 74 percent, respectively, in Nevada, and 37 percent and 68 percent, respectively, in Arizona. Two recent events in particular have energized Latino voters and illustrate just how important the immigration issue is to them. One of these was President Obama’s June 15 announcement to grant deferred action to DREAM Act-eligible students, allowing young Americans who were brought to this country at a young age to live and work legally. In fact, in five key battleground states (Arizona, Colorado, Florida, Nevada, and Virginia), Latino Decisions found a significant increase in Latino support for the president after the DREAM Act announcement. This bump comes on the heels of a Bloomberg poll that found that voters in general support the president’s announcement by a 2-to-1 margin. The other event was the Supreme Court’s decision in Arizona v. United States on June 25, which struck down three major parts of Arizona’s anti-immigrant bill S.B. 1070, while leaving the harshest racial profiling provision standing. In a national poll of Latino voters to be released by Latino Decisions, along with the Center for American Progress Action Fund and America’s Voice, two-thirds of respondents stated that they opposed the Supreme Court’s decision to uphold the racial profiling provision of Arizona’s S.B. 1070, with only 29 percent supporting it. What role these voters will play in this November’s election as well as in future Novembers is still an open question. But what is clear is that how candidates and parties talk about immigration will heavily influence the future of the Latino vote. Philip E. Wolgin is Immigration Policy Analyst at the Center for American Progress. Latino Decisions, Center for American Progress, and America’s Voice national Latino voters Supreme Court poll of 500 Latino Registered Voters Nationwide, +/- 4.4 percent, full data to be released on July 23.